When the weather starts to get cold outside I start thinking about hearty, body-warming dishes to serve my family. The only trouble is, usually those types of dishes take hours to prepare and are virtually impossible to make in the middle of the week. That’s where the handy dandy slow cooker comes in. It takes a weekend meal and plops it right into the middle of the week! Now, I’ve traveled all over the world. And I have to say my favorite food destination was Singapore. Why? 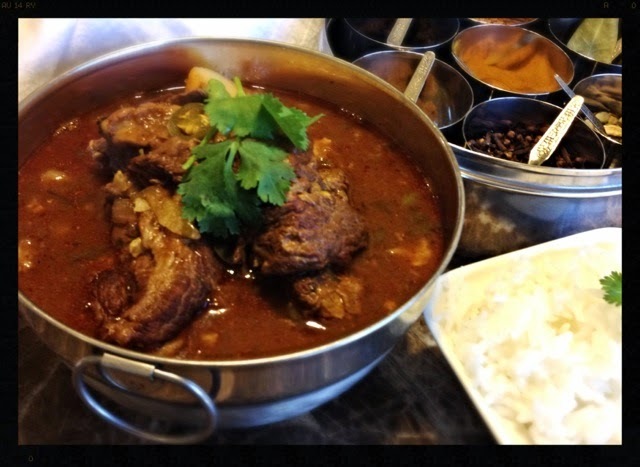 Because Singapore offered a very diverse array of flavorful curries - Indian and Thai (among others.) When I was little I was introduced to Asnie, a beautiful Malaysian woman (whom I adored with all my heart.) I noticed that she would always bring her own curry lunch or dinner, which was significantly hotter than anything we ever ate. I used to beg her to let me try her curry. She always hesitated but relented under my barrage of begging. HOLY CANOLI IT WAS HOT. But, I loved it. She would laugh and tell me that I was very brave. I learned a lot from Asnie. But mostly I learned to appreciate her culture and all of the cultures around which I was surrounded. In her honor, I made my own version of an Indian curry. But, let me preface this with the fact that I know that there are a lot of vegetarian Indian curries. My Indian Beef Curry is my own take on a traditionally vegetarian dish. It’s a work in progress. I’m still perfecting this recipe, but here it is in all its naked glory. I hope you enjoy. Heat the coconut oil on high in a Dutch oven. Season the beef with salt. Divide the cubed beef into two batches. Brown the first batch of beef on all sides, about 4 minutes. Remove to a plate and brown the second batch on all sides, about 4 minutes. Remove the beef from the pot and set aside. Remove the pot from the heat and add the onion, cinnamon stick, garam masala, turmeric, cloves, cardamom seeds, peppercorns, paprika, chili powder, ground coriander, cumin, fenugreek seeds, ginger paste, garlic paste and Serrano peppers. Put it back on the heat on medium-high and stir around in the bottom of the pot until fragrant (about 2 minutes.) Add the tomato sauce, fresh tomatoes and curry leaves (or bay leaves) and stir together. If it is too thick or starts to stick to the bottom of the pot, add about 1/4 cup of water to the pot and reduce the heat a little. Put the beef back in the pot and stir to coat with the spices. Transfer everything to the Hamilton Beach Set & Forget 6 Quart Programmable Slow Cooker. Add 6 cups of water, 4 teaspoons of salt and the potatoes. Stir and then cover. Cook on low heat for 7 hours. After 7 hours of cooking, cut your cauliflower into 1 1/2-inch flowerets and wash the lentils to be sure there are no stones hidden among them. Add the cauliflower and lentils to the slow cooker and stir to combine. Turn the temperature up to high and cook for an additional 30 to 45 minutes. Remove the cinnamon stick and the curry leaves (or bay leaves) and stir in the chopped fresh coriander. Serve over steamed jasmine rice.